The Sacred Cigar smoked by the Great Arya Sangha Monk, Luang Phu Waen Sujjino of Wat Doi Mae Pang. His cigar is said to possess Magical Powers, and is revered by the Devotees of this Monk. His Cigar, and his amulets are renowned for Metta Maha Niyom and Maha Lap Klaew Klaad magic, to bring Prosperity Metta, and powerful Protection to the Devotee. Some devotees of Luang Phu Hwaen would like to ask him for his cigar, to encase and keep as a protective luck bringer. 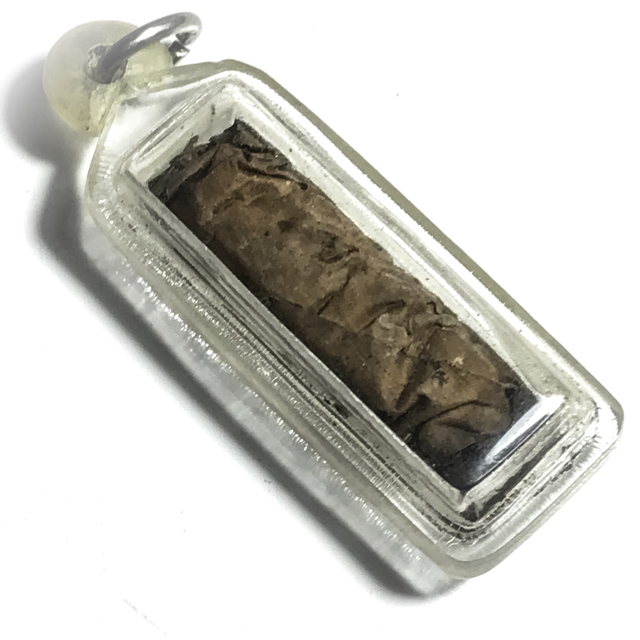 It is very rare to encounter one of Luang Phu Waen's sacred cigars, for mostly they are kept by loving devotees of Luang Phu, who willl not part with such an item that has had such close contact with the Guru. His Buhri Saksit cigars are seen as sacred objects which have had direct contact with the Guru, and which were blessed before he would give them to the devotee. This is of course an amulet with obvious relation to faith in the Guru, for those who seek not just an amulet, but a connection with the Guru, in this case, the High Arya Sangha Monk, Luang Phu Hwaen Sujjino. This sacred cigar is worn as Buddhanussati and to recieve the protection and blessings of this great Arya Sangha Monk, who was one of the Greatest Master Guru Monks of the last Century, Luang Phu Hwaen Sujjino. He ordained as a novice in 1892 at Wat Po Chai in Na Pong at the age of nine to fulfill the wish of his mother when she died while he was five years old. At the age of 13, he became a Naen (novice monk) at Wat Poh Chai, Loei province. He studied with teachers and later ordained as a monk at a temple in Hua Taparn District of Ubon Ratchathani at the age of 21. As a novice monk, he studied the Dharma and Pali, even at that young age he showed exceptional ability. He eventually went Thudong (forest monk) with his teacher, Ajarn Wuhan, travelling from Loei to Ubon Ratchathani, where he remained to learn Dhamma from another teacher, Ajarn Sing. During his Thudong, he met disciples of Ajarn Mun whom he had wanted to further his studies under.